Now on her eighth studio album, the ever-evolving multi-instrumentalist Polly Jean Harvey is fast becoming an English national treasure. 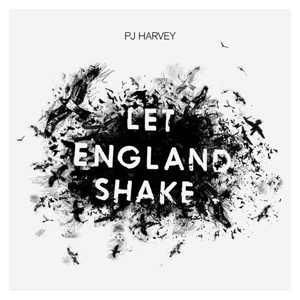 Perhaps in a concerted effort to speed her elevation to the status now enjoyed by the likes of Kate Bush and Siouxsie Sioux, new folk-inspired album Let England Shake is dedicated almost entirely to her homeland; “the country that I love” as she declares on the patriotic, shiver-inducing ‘England’. But as you would imagine, Let England Shake is far from a perfume-scented love letter. The ambiguous title reflects the love/hate relationship Polly catalogues lyrically with tracks like the waltzing, brass-enthused ‘The Last Living Rose’ which, in typical ‘English’ style, berates the “God-damned Europeans” before lovingly detailing a Doherty-esque, dirty Albion of “battered books” where one walks the “stinking alleys” to the “music of beatings”. The nearby Thames, the symbol of British colonialism and power, glistens “like gold”, but the simile is turned swiftly around with a skillful twist as that gold is “hastily sold/For nothing”, a reference no doubt, to the £2bn Gordon Brown lost selling off half of the UK’s gold reserves. Elsewhere, the futile human cost of England’s perpetual war-mongering becomes the focus of many songs. As Harvey sings on ‘England’ her country of birth certainly leaves “a taste/A bitter one”. While there are a few moments reminiscent of ‘classic’ Harvey - the grungy guitar and spectral vocals of ‘In The Dark Places’ and stand out track ‘Bitter Branches’ recalling her earlier material, Harvey has generally stayed true to her promise to refrain from repeating herself. However, whether or not in this case that’s a good thing, is perhaps debatable. Reviews have generally been favourable but like many ‘experimental’ records it’s an uneven and fragmented affair.